Florida Huddle took place in Daytona Beach this year. DAYTONA BEACH - Hundreds of exhibitors, tour operators and travel wholesalers. Thousands of meetings. And three days of sun, food and entertainment. This year’s Florida Huddle is officially in the record books following a remarkably busy week in Daytona Beach. The sparkling Ocean Center in Daytona was the venue for this year’s event, which also featured trade media from North America, Europe and South America. 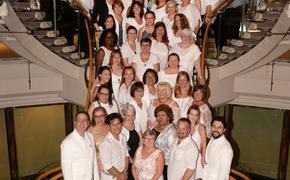 TravelPulse Canada was among those selected to attend. 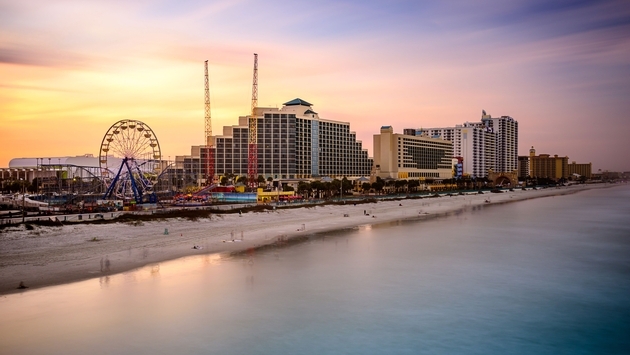 Media met with more than a dozen tourism and hotel representatives from around the Sunshine State and had a chance to explore Daytona Beach, which has undergone a major resurgence and is poised for even bigger and better things ahead. Sunwing will begin flying to this east coast Florida city this month, with Monday and Thursday service from Toronto beginning Jan. 28. 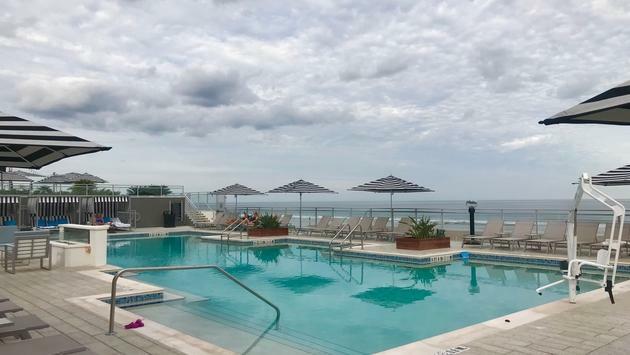 The media were treated to three nights at The Hard Rock Hotel, a terrific property that’s right on the beach and about a kilometer north of The Ocean Center and close to the main pier and shopping districts. The 200-room, Four-Diamond property opened last May and features a beautiful swimming pool complex, complete with a powerful (trust me on this one) hot tub, a large pool that’s great for doing laps and a cute play area for kids that features several large fountains spraying water into the air. The Hard Rock Hotel Daytona Beach has a beautiful swimming pool complex. The main floor restaurant, Sessions, serves up a nice breakfast with parmesan hash browns. There’s also a handy coffee shop, a store selling Hard Rock paraphernalia and a good-sized gym with the latest equipment. My room was quite large and bright, with a balcony overlooking the ocean and various musical touches, including an album cover outside the door. (I somehow ended up with Barbara Streisand, not exactly known as the hard rocking type. But there was a great photo of the Rolling Stones by the elevator, as well as a jacket that Stones’ guitarist Ronnie Wood once wore to his birthday party). 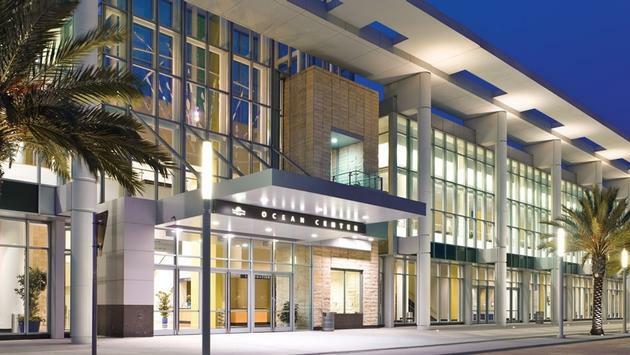 The Ocean Center is a beautiful, modern convention space in Daytona Beach. The lobby features a very cool sculpture made of shiny gold cymbals, and there was a drum kit right next to the front desk. I also spotted several lovely guitars hanging about, along with memorabilia from The Beatles, The Beach Boys and other groups. The first opening night event was held at The Hilton Daytona Beach Oceanfront Resort, directly across from Ocean Center. It’s a 744-room affair with beautiful landscaping and a bright, clean look. Later that night we were treated to a fabulous indoor reception at the Hard Rock Hotel, with great food, followed by a raucous rock and roll show out by the pool. The media also had a nice meal at The Shores Resort and Spa in Daytona, where they’ll provide you with a s’mores kit so you can roast marshmallows at one of their fire pits by the beach. The pool area is quite attractive, and the lobby features a pretty fountain and tons of dark wood that give it a bit of an English country home feel. 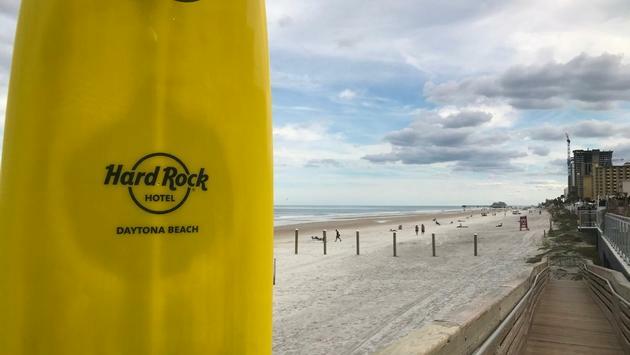 The Hard Rock Hotel Daytona Beach sits on a fine stretch of sand. The final evening was held at ONE DAYTONA, a new dining and entertainment complex across from the Daytona Speedway. We sipped cocktails and sampled from a half-dozen restaurants, including a nice Italian place, a BBQ joint called Oklahoma Joe’s and a PF Chang’s. ONE DAYTONA is home to both a Fairfield Inn and a posh hotel called The Daytona, which is a Marriott Autograph Collection property that is set to open in early spring of this year. A new, oceanfront Marriott Renaissance is being planned for an oceanfront lot just north of The Hilton. Daytona is known for its 23 miles of white-sand beach and, of course, for the speedway. It’s also home to terrific golf courses, including the plush LPGA International. The Ponce Inlet Lighthouse, just south of Daytona Beach, Florida. The Museum of Arts and Sciences is affiliated with the Smithsonian in Washington DC and has a wonderful collection with a kids’ museum and more than 30,000 objects. The museum campus also is home to the Cici and Hyatt Brown Museum of Art, which has the world’s largest private collection of Florida watercolour and oil paintings. The city also is home to the Southeast Museum of Photography. One of the great attractions in the area is the Ponce Inlet Lighthouse and Museum, Florida’s tallest light station (see photo above). It’s a beautiful, red structure that juts out from among the greenery and features a beautiful, spiral staircase and 360- degree views. 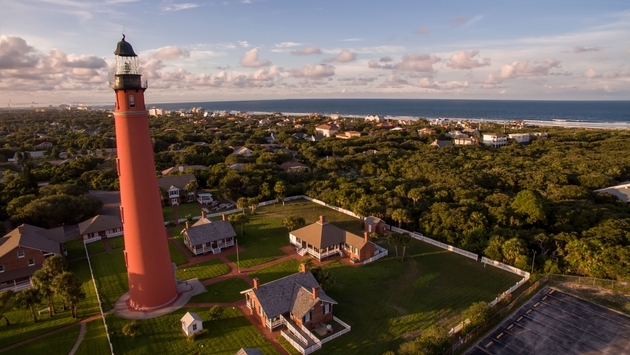 It’s my favourite Florida lighthouse, and it’s only a short drive from downtown Daytona. 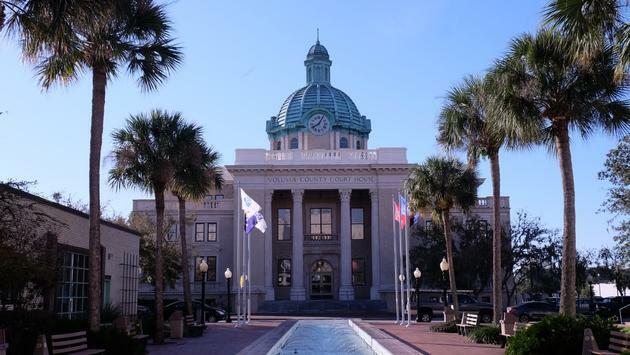 DeLand, Florida is a short drive from Daytona and features a fabulous downtown and great architecture, including the Volusia County Courthouse. Another great spot nearby is the town of DeLand, which has been cited as having one of America’s best downtowns. I had no idea it was so beautiful until I stopped there in December on a trip from New Smyrna Beach (a wonderful beach town just south of Daytona) to Ocala. The Volusia County Courthouse is a stunning bit of architecture in DeLand, while Trilogy Coffee serves up the best coffee latte I’ve had anywhere on the planet.